Switching from a lightweight laptop to an enormous tablet is a snap, but the unit still has some issues. The newest version of Acer’s Aspire R13, a convertible laptop that can be used as a tablet, is a sleek looking thing. A versatile unit with ample power to perform most everyday tasks with ease. It’s an interesting prospect for someone looking for a 2-in-1, but not without its problems. The Aspire R13 has a 13.3-inch screen, a size we found very comfortable for everyday use and when flipped on it’s hinge makes a very large tablet. The unit weighs in at 1.55 kg which was not too heavy to carry around. It’s thin too at around 20mm, but is still a solid design and has its U-shaped hinge that lets the screen flip over quickly and easily. This U-shape does makes the R13 look a little odd but it was not enough to really bother us. All of the processing power still sits in the base of the laptop. The version we reviewed includes Intel’s 6th generation chip, the Core i5-6200U (up to 2.7Ghz), integrated graphics, 4GB DDR3 Memory and a 128GB Solid State Drive. Not as powerful as the one we had seen previously but still powerful enough for most tasks even though the lack of dedicated graphics rules this model out for serious gaming. The lithium-ion battery sits in the base as you would expect and we were fairly happy with the life we got out of it. In our standard test, in which we disable power management, enable Wi-Fi, maximise screen brightness, and loop a Full HD MP4 video file, the battery lasted 5hr 15min, a few hours short of the time quoted in Acer’s data sheet but still reasonable. It comes with a good length cord for charging, though you still need be careful not to hit the power button when plugging it in, it’s placed right next to the power port on the chassis. Loaded with Windows 10, the unit also comes with a 30-day trial of McAfee and many other programs that produced far too many alerts. The R13 also has HDMI (full-sized), three USB ports (two of them USB 3.0), a headset port, and an SD card slot (full-sized), though SD cards stick out halfway. You still get a webcam and Bluetooth, but the new additions Acer is touting include Thunderbolt support and Qualcomm VIVE 2x2 802.11ac Wi-Fi that Acer says allows up to three times faster downloads, but we did not notice a big difference on a network with 10 devices and an ADSL2+ connection in Cammeray. The 13.3-inch screen has a Full HD resolution, the colours look great and as it’s an IPS (in-plane switching) monitor, can be viewed from many different angles which is very important for a transforming laptop like this. However, there were a couple of issues with the screen. When adjusting the screen looking for a better viewing angle we found the R13 was a bit quick to switch between laptop and tablet mode. Possibly the most irritating aspect of the R13 is that, in tablet mode, there is seemingly no way to adjust the volume. This made watching video less enjoyable in tent mode as adjusting the volume requires holding the function key and adjusting the volume with the up and down arrow keys. A task that is tricky in tent mode and impossible in tablet mode. Having said that, moving from laptop mode to tablet and in between is very easy with the R13. Simply apply some pressure to the bottom of the screen to pop it out of the hinge, and then lock it into place once it has turned all the around and faces out. In addition to tablet mode, you can use display mode (which is the screen facing outwards with the keyboard behind it), and tent mode. Due to the way the hinge works, you can also bring the screen forward over the keyboard to save space. We found the keyboard mostly easy to use but would have preferred dedicated volume keys to the function activated ones described above. The backlit keys are mostly full sized (apart from the arrow, page, and Caps Lock), despite the shallow travel distance feel tactile enough to be comfortable throughout extended use. The trackpad is not as easy to use, it was far too sensitive for our liking. So much so that we had to be careful scrolling up and down Web pages as we often found we were zooming in and out without meaning to. 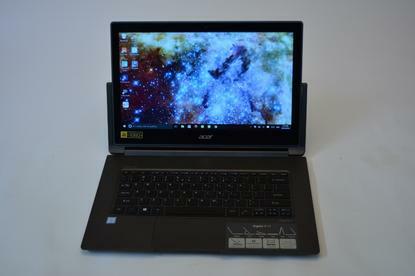 We enjoyed our time with the Aspire R13 but wonder about the overall versatility of the unit. It works fine mostly as a laptop but is too cumbersome in tablet mode to hold for long periods and the issues with the trackpad were especially frustrating. If you are looking for a 2-in-1 the R13 is a solid contender at $1530 but not as versatile as some competing products with detachable screens.